William Paepke married Mathilda (?). Alfred Bauer married Sarah Rose Paepke, daughter of William Paepke and Mathilda (?). Alfred Bauer died before 1994. Married Name Her married name was Paepke. Mathilda (?) married William Paepke. (?) Alt married Clara Pletzer, daughter of John B. Pletzer and Katherine Alt. (?) Broderick married Rosia Pletzer, daughter of John B. Pletzer and Katherine Alt. (?) Young married Mary Pletzer, daughter of John B. Pletzer and Katherine Alt. Herman Pletzer was the son of John B. Pletzer and Katherine Alt. Herman Pletzer died before 1998. August Kopp was the son of Charles A. Kopp and unknown (?). George Kopp was the son of Charles A. Kopp and unknown (?). Henry Helling married Clara Kopp, daughter of Charles A. Kopp and unknown (?). Leonard Lonsberg was the son of Benjamin W. Lonsberg and Mary Agnes Cotte. George Quincy was born after 1880. George Quincy died after 1955. Wayne Germaine died after 1976. 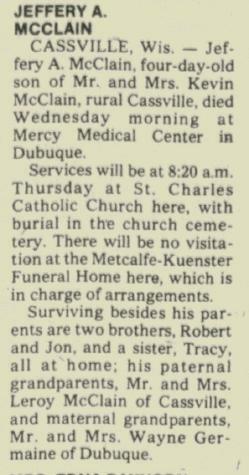 Jeffery A. McClain died in January 1977 at Dubuque, Iowa, 4 days old; Jeffery A McClain obituary. He was born in January 1977. Ervin Lincoln Haskin married Theresa R. Weitzel, daughter of Peter Weitzel and Mary Zeckman, on 15 September 1887 at Dane, Wisconsin. John P. Linden married Lelia Corlett. John P. Linden was born circa 1903. He was the son of (?) Linden. 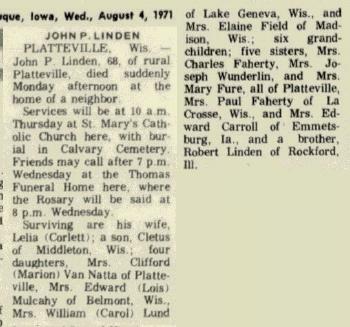 John P. Linden died in August 1971 John P Linden obituary. Married Name Her married name was Linden. Lelia Corlett married John P. Linden, son of (?) Linden. Lelia Corlett died after 1971. Cletus Linden was the son of John P. Linden and Lelia Corlett. Lois Linden was the daughter of John P. Linden and Lelia Corlett. Lois Linden married Edward Mulcahy. Edward Mulcahy married Lois Linden, daughter of John P. Linden and Lelia Corlett. Carol Linden was the daughter of John P. Linden and Lelia Corlett. Carol Linden married William Lund. William Lund married Carol Linden, daughter of John P. Linden and Lelia Corlett. Married Name Her married name was Field. Elaine Linden was the daughter of John P. Linden and Lelia Corlett. Elaine Linden married (?) Field. (?) Field married Elaine Linden, daughter of John P. Linden and Lelia Corlett. Raymond Meier married Grace Stanton, daughter of Eldridge Stanton and Cora May (?). Raymond Meier died after 1966. William Jackson married Iva Stanton, daughter of Eldridge Stanton and Cora May (?). William Jackson died after 1966. DeVern Mathison married Mary K. Kreiser, daughter of Earl Henry Kreiser and Eva Elizabeth Wilmott. John Horsley married Elizabeth Ames, daughter of Jacob Ames and Mary Ward, circa 1890. John Horsley died after 1911. Elmer Horsley was the son of John Horsley and Elizabeth Ames.